UPDATE! IT IS 01/11/11! What does it mean? I DON'T KNOW! John Pearson (artist extraordinaire and friend) has put together cover art (based on Jay's thoughts - a little of mine) for Underground. He is finalizing the artwork, but I thought I'd put it up since I'm pretty dang excited about it. If you haven't already had a listen, please click the "play" button above and check out the music. I'm hoping to get back over to Jay's place in the next couple of weeks to finish mixing the project. Would love to hear some comments on the mix (if you're willing to lend your ears). 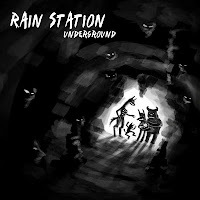 If not, just have a listen and enjoy this new Rain Station project.